Goat Island Skiff Amateur Style and the Sea Pearl 21 Too: Portland almost to Seguin Island, and back. Portland almost to Seguin Island, and back. 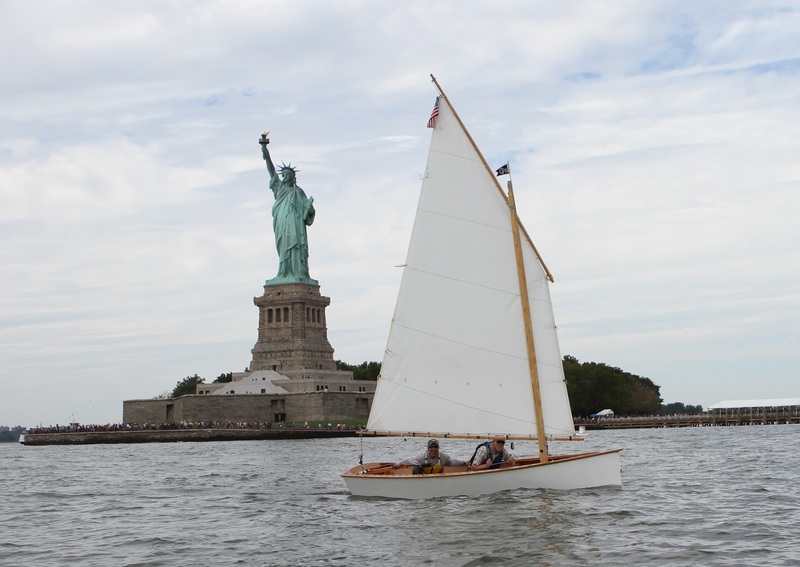 Before we get started on some SeaPearl 21 adventuring in Casco Bay, I want to point out Dave-in-NJ's blog about his Goatee Goat Island Skiff "Chivita" and some pretty damn epic sailing he did around New York Harbor. It's somewhat of a departure from my Goat perched on a wild island in Down East Maine, but it is just as epic, if not more for the sheer stupendousness of that mother of all cities, New York City, and her crazy harbor. Please see this post in particular. If your heart doesn't get thumping, you must not like Goat Island Skiffs, and I question why you are here in the first place. Dave, you go man. You go. Impressive. 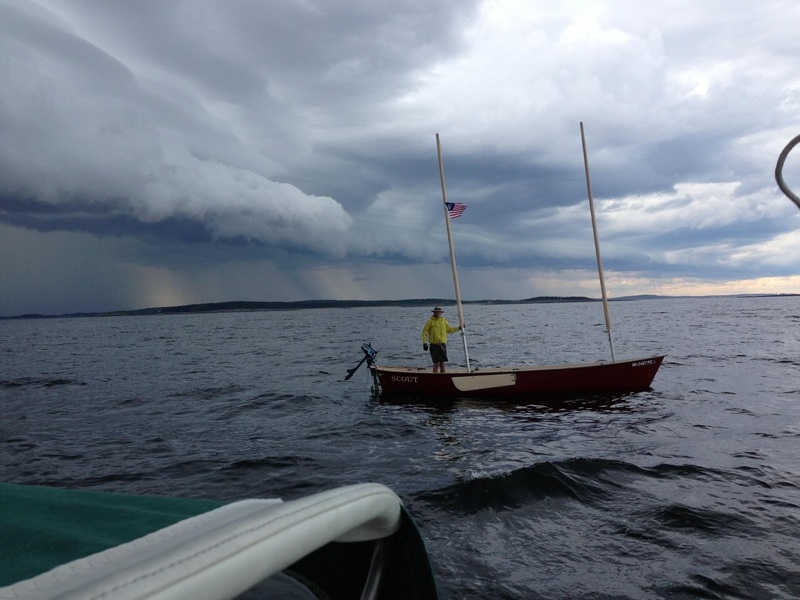 In which SeaPearl Scout and I sail around Casco Bay, meet a squall, and get boarded by fictitious pirates. I headed out of South Portland recently and met up with a Pearson 30 as she sailed north along the Maine coast, destination Brooklin and WoodenBoat. I planned to be along for a day, maybe two. 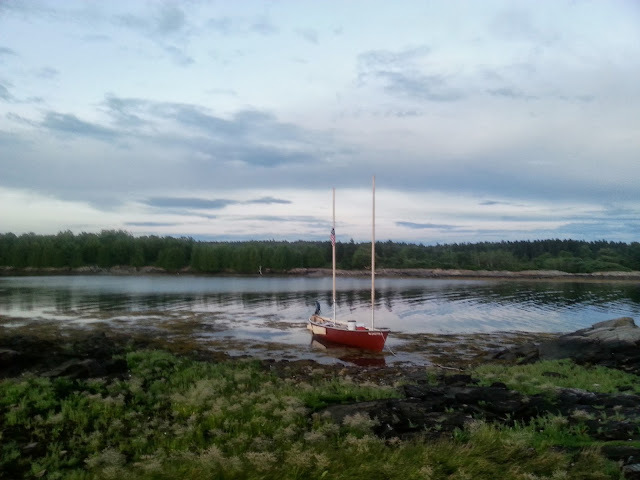 The first night's destination was either going to be Damirscove Island or Seguin, depending on distance travelled. I thought I could probably make Seguin via Half-Way Rock, but Damirscove was probably out for me due to the distance and my energy level. The weather was fine, with a remote chance of thunderstorms, and calm winds gave way to a beautiful stiff breeze of the kind that you can only really find on salt water. Blowing out to Half-Way Rock with nice water and a good breeze! After I had passed Half-Way Rock (no pictures, sorry, but lots of seals!) it started to become blatantly obvious that the slight chance of thunderstorms was going to probably become a very real chance. In the deeps of my ears I imagined I could hear low-frequency rumbling, even though the sky still looked somewhat innocuous. Soon however, it was apparent that we were in for a blow. I cracked down to make as much mileage as I could towards Small Point/Cape Small not in a vain attempt to outrun the storm, but to get closer to the shore so that if things went bad, I wouldn't be miles out to sea. Behind me, the wall of bruised green and black advanced, with thunder filling the air. It was on. My buds in the Pearson 30 became insignificant by contrast. I hoved-to and started preparations. Trouble is creeping up on the Pearson 30! Run guys, run! Battened down. Small Point in the distance behind me. Trouble is on it's way! We tied Scout up and towed her behind the Pearson 30, which was actually a mistake. When the squall hit she sailed on her own, and the skipper had to stay ahead of her. It would have been far more desirable to hunker down in Scout and ride out the storm with her as it would have been significantly less nerve wracking. Lesson learned. When the storm passed the crew of the Pearson decided to make for Damirscove, and I broke off and headed towards Harpswell to a small island on the Maine Island Trail. The Squall over, I take my leave of the Pearson 30 and sail out of the dark and into the sun. This was a good feeling. I reached the island after navigating around and over several treacherous reefs (again, yes! 6" draft!) and found that there were few good access points. I was somewhat chuffed at the description of this particular island as I was lulled into thinking I'd have a good beach, but with a stable west breeze, Scout was held perfectly in a small cove with a flat bottom so she could bottom out at low tide. Exhausted after approx 22 miles of sailing, I ate some rice and crashed in my tent on shore. Nestled in for the night... or is she? My view in the morning. Peaceful. I am happy! With little fanfare (I'm pretty sure I was naked) I went running out of the tent down to the shore and around the corner, where I found Scout slightly south of her original position and bottomed out on a now not-so-flat bottom, her bow pointing skyward, and my booms sliding down to the stern of the boat. No pirates, but a sorry sight! It looked steeper in real life. When you are waiting for a tide to fix your sorry boat, you might as well make coffee. When the tide came back up and floated Scout into position, we hauled back for Portland. Southbound, I had some of the finest sailing I can recount this year, making significant mileage against the tide with a steady breeze. There was much hollering and hooting and, as with IAZ,P, lobstermen waved cheerfully as we passed. The wind really picked up and we reefed down continuously as the day progressed, finally putting in at Fort Gorges in Portland Harbor where we waited for the wind to calm a bit so pulling the boat out of the water wouldn't be as dramatic. Scout happily sat in the small harbor while I read my WoodenBoat and napped on the beach. This is summer. This is happy. Thanks. I needed one of your adventures this morning. Thanks for sharing. Keep on sailing!